Poyomi Photobooks are a simple and elegant solution to the problem most of us have these days: What do I do with all of my digital photos? My own Flickr account alone currently has nearly 22,000 photos,and will surely exceed that soon. I love every photo I've taken, but not enough to print them all, and it's difficult to justify the time of moving all of my favourites to a USB drive and going to the photo store at the mall. But I do wish that I could have copies of some of my more precious images, to show my friends or reminisce over. What better way to order a physical copy of your photos than though your computer/the Internet, where most of them are likely to be stored? Better still, Poyomi allows to to print them directly into scrapbook form, saving you yet another time-consuming process. And for as little as $5.99 for a 20 page book, Poyomi has made it quite affordable too. Poyomi's interface allows you to access your online albums and then drag-n-drop the images of your choice into a cache to be arranged into book format. You can choose images from your computer/memory cards, Flickr, Picasa, and SmugMug. At this stage I should mention my only grumble about Poyomi - the inability to search within your albums by keywords. I connected to my Flickr account only to find every image I have before me in chronological order. It wasn't very conducive to searching out those favourite images and, for a few minutes, I was stymied. I hadn't given much thought to what I wanted my album to be about and not being able to pick and choose with freedom put a damper on my enthusiasm. 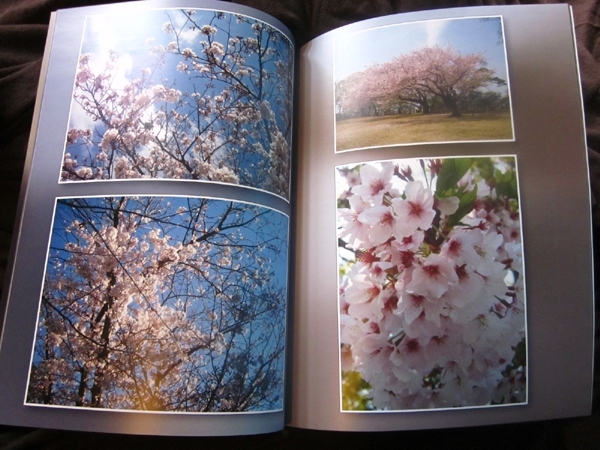 But then I had a brainstorm and was rolling again - I have a pretty extensive collection of photos of Japanese cherry blossoms, and that is what I wanted immortalized in book form. To do that I went into Flickr and sorted them into a set, and then returned to Poyomi to select images from that set alone. Problem solved, I continued. The next set is Organization - you can arrange the photos chronologically, by name, or in your own custom order. At this time you also have the option of tagging the pictures individually. I chose to opt out of captions, instead letting the images speak for themselves. The next step was Design - choosing the colour scheme of the book itself. You have a variety of tonal themes - plain white or black backgrounds, or background composed of blended colours taken from the images. I went with the blended colours, known as Fresh, and was delighted with the result. And finally I designed my cover - one of my images across two pages, with proper book-binding rather than staples. 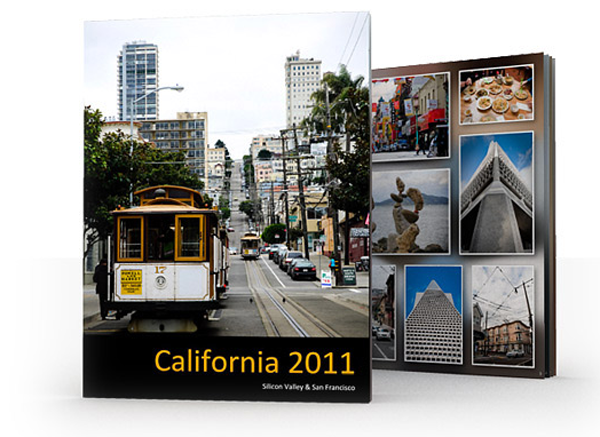 An interesting service Poyomi offers is a web address unique to your photobook, that you can share with your friends or revisit if you're not ready to print right away. You can view my photobook in its entirety here (and I hope that you do - it is gorgous!) After previewing and approving of it there was nothing left but to request the printing and shipping. The final price for this work of art: $9.00! Figure 1. The finished product, in all its glory! The photobook was delivered within days of the order, and came protected in cardboard packaging, saving it from travel damage. The paper is glossy and sturdy - similar to those of a colour yearbook. The printing is clear and without artifact. I really feel that it has done justice to my photos. I could not be happier with it - it now has a place of honour on my bookshelf. The folks at Poyomi would like for you to experience the same joy - they've issued a discount code for Digital Home Thoughts readers. Simply go to www.poyomi.com/coupon/dht2011. A 15% discount will be automatically applied to your session, and you can have your favourite photos in your hands in no time. Angelina Purpura is a gadgets enthusiast, amateur photographer, and an obsessive consumer of web media. She has a lot to say about movies and food, which you can read about on her Twitter @Anzi.